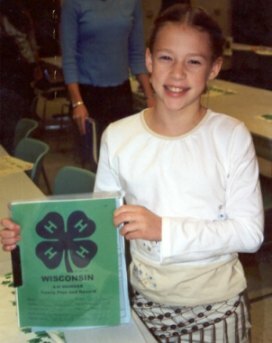 Join a 4 H Club Of America! Joining a local 4 H Club would be one of the best things you could do for both you and your homeschool children. Visit the National 4-H website to find a club near you. To develop life skills in youth. To develop a servant's attitude toward the community. Of course, we had fun! But our club went that extra mile to give without expecting anything in return. Below is a list of some of the things our club did. Laura and Garrett (holding the clear bags) with friends Libbey and Johanna. 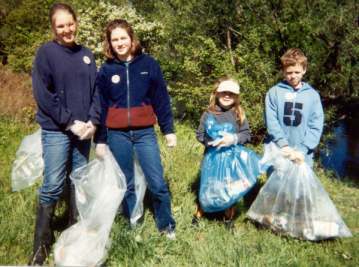 They participated in the River Clean-Up back in 2004. Giving of yourself is very rewarding. What did we forget? Contact Me and I'll add it to the list! 4-H is one of the largest youth development organizations in America with more than 6.5 million young people, ages 5-19, 538,000 youth and adult volunteers, more than 3,500 staff and 60 million alumni. 4-H is in all 50 states, U.S. territories and on military installations worldwide, with 55 percent of 4-H members living in cities, large towns and their suburbs and 45 percent living in small towns and farms. 4-H members span all backgrounds with 20 percent representing minority racial populations and 13 percent representing Hispanic or Latino ethnic populations. 4-H includes both genders with 52 percent female and 48 percent male. 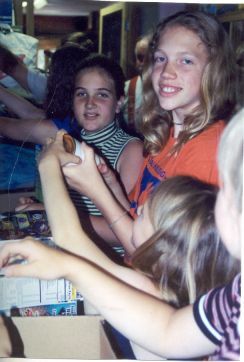 Your 4-H year always ends by completing a Record Book. It was not always the most fun thing to do, but it is a wonderful record of years of accomplishments. It has been a joy to flip through their record books. Without them I could not have made these web pages for you! Enjoy!